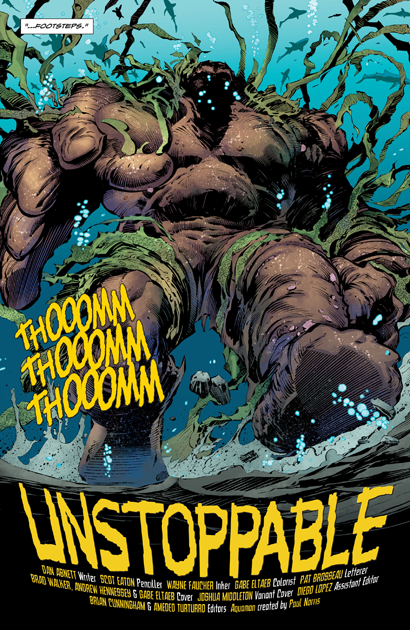 "Unstoppable" by Dan Abnett, Scot Eaton, Wayne Faucher, and Gabe Eltaeb. We open with Mera at the Tower of Widowhood, an ancient temple run an order of less-than-humorous Atlantean women who plan on conducting test to see if Mera is "good enough" to marry their king. Meanwhile, Aquaman is alerted to the seismic booms taking place outside the city, and he, Murk, and some of the others go to investigate. It doesn't take long before they spot the massive creature lumbering its way forward. 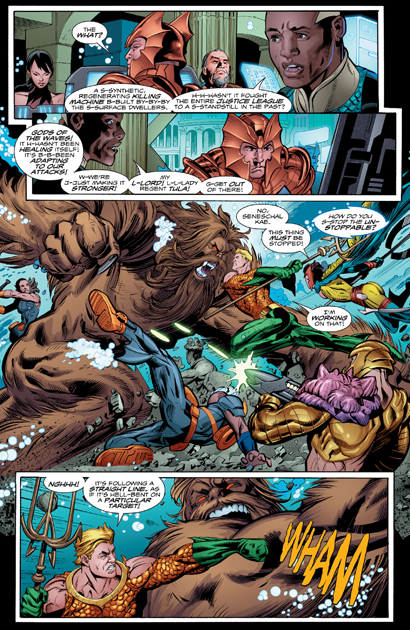 Aquaman tries to communicate with it, which is met with a left cross, sending the Sea King flying. Not only is the creature incredibly strong, but it seems to be able to heal itself instantly. 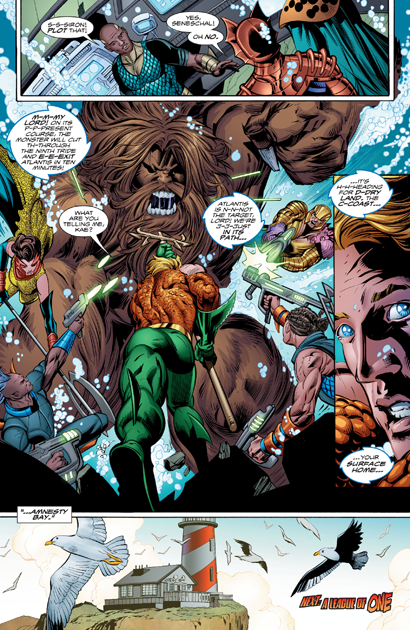 After falling back, Aquaman and Tula discuss strategy, and they bring out the big guns--literally. Atlantean craft fire "plasmit cells", which only stop the monster long enough for its real identity to be discovered--it's the old JLA foe, The Shaggy Man! 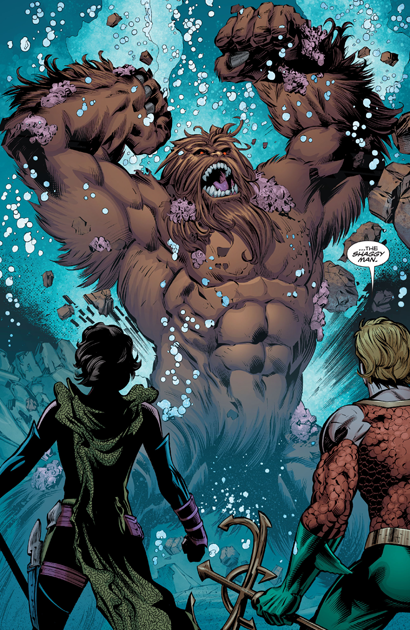 As Aquaman tries to stop it, he is told that the monster's target isn't, in fact, Atlantis, but--Amnesty Bay! To be continued! 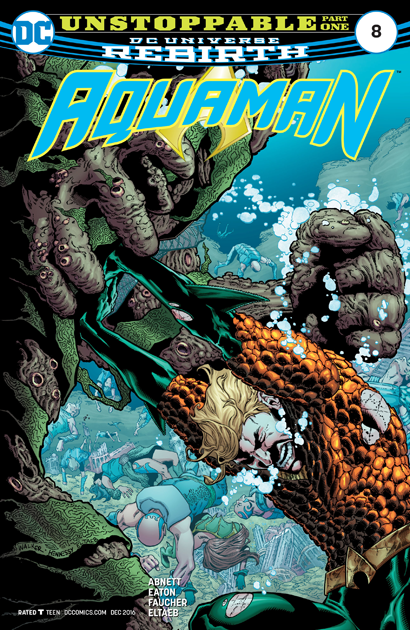 After an issue of Aquaman whining about running Atlantis, I'm of course happy to have him back out getting involved in super heroics, and bringing in an old(?) JLA foe is a good way to do it! Like the Sea King, I'm not thrilled that he will potentially be separated from Mera for months, as she undergoes her tests, but luckily comic books can compress time so it (hopefully) won't take that long. (By the way, I assume Diana Rigg will be playing the head widow in the upcoming Aquaman movie?). I liked the moment where Aquaman realized that Tula is pretty good at what she does, and she doesn't need to be micromanaged like her assumed. Does this mean we'll eventually get our power couple back to Amnesty Bay and have Tula run Atlantis? I'd be up for that (and I think she would too). As usual, the book's cover by Brad Walker is outstanding. The inside art by Eaton and Faucher is solid if indistinct, although the action sequences are pretty good. I have mentioned before, both here and on The Fire and Water Podcast, that I wouldn't mind the book going back to a typical monthly schedule if it meant we could get Brad Walker doing every single issue. In the meantime, I do enjoy seeing so much Aquaman, I have to admit. At this rate, we'll get to issue #76 in no time! 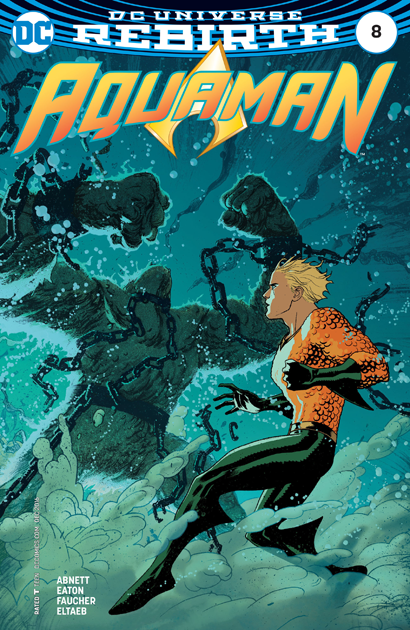 Aquaman #8 is on sale now! I'm enjoying the bi-monthly schedile. It really allows the plot to move and be intricate at the same time. I'm even enoying the Atlantis based issues, there are some good characters and plots developing.